This article first appeared in Personal Wealth, The Edge Malaysia Weekly, on April 16, 2018 - April 22, 2018. Investors who are thinking of investing in gold as a safe-haven asset should consider exchange-traded funds (ETFs) that are backed by the precious metal. Experts are upbeat on the outlook for these funds, saying that gold-backed ETFs are a good way to gain exposure to the physical asset at a lower risk compared with gold stocks. “If investors aim to hedge against rising inflation and their positions in the equity market, we think a gold ETF structure backed by physical assets would be a smart option. That is because an ETF offers direct exposure to gold price movements by passively tracking international prices,” says AIIMAN Asset Management Sdn Bhd managing director Akmal Hassan. History has shown that gold outperforms equities in a bear market while gold-backed ETFs have been seeing fund inflows since 2016, says Akmal. This trend is evident in Asia, where these ETFs increased their gold holdings by 7.9 tonnes (worth US$318.1 million) in February, he adds. 3.1 tonnes last month. However, Europe and other regions reduced their holdings by a total of two tonnes. Oanda Asia-Pacific head of trading Stephen Innes says gold-backed ETFs offer “the best of both worlds” without the hassle of storing physical gold. He adds that many ETFs offer exposure to physical gold that is stored in bank vaults. “Buying into these ETFs is as good as going to your local jewellery store and buying 999 gold bars. The ETFs offer access to smaller investors who do not have US$2,000 readily available to buy an ounce of gold every week,” says Innes. “The funds are also able to offer competitive rates on tranches of gold through ETF markets. Some of the markets track a basket that is 100% correlated to the underlying gold while others track a basket of gold miners. While there are ETF products that invest in a basket of gold producers (equities), it is a “trickier” investment, says Innes. He points out that if the broader stock market collapses, gold equities could also fall, even if spot prices are moving higher. “The difference between the two — and sometimes investors do not realise this — is that when gold goes up, the ETFs that have 100% exposure, or are 100% correlated to underlying gold, will move accordingly,” says Innes. In this scenario, mining companies may start selling off quite aggressively despite the fact that the price of the commodity they mine is going up, says Innes. In the current risky environment, with about 40% of gold investors using the precious metal as a hedge against a possible equity meltdown, the more practical trade is to have an ETF that is more strongly correlated to gold price movements. April 6, GLD’s one-year return was 5.17% while SGOL’s stood at 5.18%, according to Bloomberg. GLD shares are listed on the NYSE Arca, Bolsa Mexicana de Valores (Mexican stock exchange), Tokyo Stock Exchange, Stock Exchange of Hong Kong and Singapore Exchange. According to the SPDR Gold Shares website, the shares closed at US$125.60 apiece on April 9 while their one-year return stood at 5.92% as at March 31. SGOL shares are traded on the NYSE Arca and Bolsa Mexicana de Valores. The shares closed at US$128.94 each on April 9 while their one-year return stood at 6.08%, according to Bloomberg. The latest World Gold Council report says gold-backed ETFs globally increased their holdings of the precious metal by 22.5 tonnes last month, bringing their total to 2,415 tonnes (worth US$102.8 billion). It adds that while gold prices finished the month relatively flat, a significant portion of inflows was the result of periods of sharp price rallies on strong volume, especially in the second half of March. “The gold price performance and volatility were driven by global trade tensions, a weaker US dollar and weak stock market performance. As equity markets tumbled, investors moved into bonds and gold. Gold is one of the best performing asset classes this year, having rallied 2.5%,” says the report. Innes describes the volatility as a “heightened risk environment”, which points to a greater propensity for investors to buy gold. He notes that the commodity is currently trading very strongly due to the “declining health” of the US dollar. “Gold is currently being used as a hedge against a weaker US dollar. What this is telling me is that investors are fearful that we could be at the beginning of a protracted US dollar downtrend,” says Innes. He adds that gold is the go-to hedge to protect the value of US assets such as bonds and equities. This would have negative consequences on these assets. 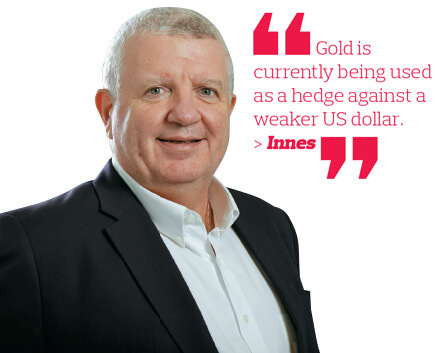 “I think that is why there is a greater disposition for investors to start buying gold — just out of fear of the US dollar weakening going forward,” says Innes. He says it boils down to whether higher US interest rates can change the downward momentum of the greenback. He points out that the US Federal Reserve is in the process of normalising interest rates. “But the US dollar is not showing any sensitivity to interest rates as traders are more concerned about the growing budget deficit and the fact that inflation is likely to be accelerated by a late cycle fiscal policy,” says Innes. Singapore Precious Metals Exchange vice-president (investments) Chris Gan says there is a very strong negative correlation between the US dollar and gold. He believes that it is the greenback that is in the driving seat and that investors’ outlook will be driven by where the US dollar will be in the next year or so. “I think the US dollar could be weaker. That is good for gold. The negative correlation between the US dollar and gold has been well documented for the last 20 to 30 years. If you go to the World Gold Council’s website, it has done a lot of research on gold prices versus the US dollar,” says Gan. Meanwhile, Akmal notes that there are growing inflationary pressures that have been supportive of gold prices, as the global economic recovery gathers strength “amid signs that consumer prices are starting to pick up again”. He says investors tend to flock to gold on signs of quickening inflation, in the belief that the precious metal is a better store of value than other assets as a hedge against inflation. “Nonetheless, it is important for investors to look at inflation in relation to real yields, which are expected to remain weak as central banks seem more worried about structurally weak inflation versus a sudden surge in inflation. Hence, major central banks — including the Fed, European Central Bank (ECB) and Bank of Japan (BoJ) — are likely to have accommodative policies in place even if inflation begins to rise,” says Akmal. Market experts say it is prudent for investors to wait until the gold price dips before investing in it. “I am more keen on buying gold when risk sentiment drops because then, a lot of investors will be selling their gold to get into what they perceive as riskier assets to try to catch a higher yield,” says Innes. As at April 9, the spot gold price was US$1,329.11 per ounce. Gan suggests that investors start to buy physical gold when prices are not so volatile. “If you look at India, the investors there do not buy gold when prices are heading up or when they are volatile. They prefer to buy when prices are stable,” he says. Akmal says while a fluctuation in gold prices means that there are short-term trading opportunities for investors, in the long run, investors should choose gold as an asset class to hedge against equity risks and to diversify their portfolio exposure, instead of chasing more short-lived price movements in commodities and metals. He adds that investors can benefit from having some exposure to safe-haven assets such as gold by reducing their portfolio volatility and reap better risk-adjusted returns during periods of rising volatility. “While we expect the global growth trajectory to continue humming along with the broad economic fundamentals remaining intact, the recent market correction will likely presage a new era of higher volatility in the markets. However, the current bullish scenario probably has legs, underpinned by a positive earnings revision cycle, including estimated 12% earnings growth in 2018 that will provide further support for valuations,” says Akmal. He adds that investors should take the recent correction as a lesson that the tide could turn at any time. AIIMAN launched the country’s first gold-backed ETF — TradePLUS Shariah Gold Tracker — last December. The fund has delivered a return of 1.9% in US dollar terms since inception while its benchmark has recorded a gain of 2.3%. However, in ringgit terms, the fund has recorded a loss of 4% while the benchmark has seen a loss of 3.6% due to the appreciation of the ringgit.